Just when you think all of the good ideas in online betting have now been done, a company comes up with something that makes you sit up and take notice. 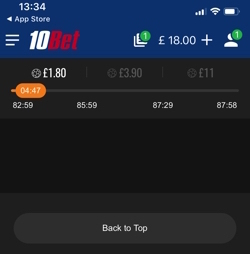 In this instance that ‘something’ that I’m referring to is 10Bet’s new feature, Pulse Betting. Here I’ll explain what it is, how it works and when you should use it. In short, it’s a form of betting that rewards you for having a wager that assumes something is going to happen in a given timeframe, that the game is going to move in ‘pulses’ or waves. Since the betting industry was first established, companies have tried to find ways of reinventing it, of making it more exciting than ever. Sometimes that’s led to a great idea being invented that takes time to catch on, such is the extent to which it’s ahead of the curve. That may well be what happens with Pulse Betting, given that it’s really just a tweak on a more common form of In-Play betting. I’ll tell you all about it here, including ways that you can try to take advantage of it in your wagering. In terms of interesting features that have come on the market in recent times, Pulse Betting is the one that’s taken me by surprise the most. The main reason why is that it’s a remarkably simple concept, yet no one has done it in the same was was 10Bet. Essentially it’s an In-Play bet on the timing of the next goal, but by specifying when you think it will be you’re increasing the amount of money you might be able to win. That’s because this doesn’t work like a typical bet, in which you’ll be offered odds and if you choose to take them then you know exactly how much you’ll win if the bet comes in. Instead, you bet on a goal being scored within a certain timeframe and the closer to the end of that timeframe a goal is scored, the money you’ll win. Let me give you a specific example. You’re watching a match between Derby & Nottingham Forest and you’ve got a feeling that a goal is imminent. You place a Pulse Bet on a goal being netting within thirty seconds. You place a £10 bet, with your returns being £100 if it’s scored within the first fifteen seconds, £250 if the goal comes in the ten seconds after that and £500 if the ball finds the back of the net in the final five seconds of your thirty seconds of allotted time. 10Bet offer a number of different time periods that you can bet on, meaning that you’ve got some leeway if you feel as if a goal is coming but aren’t totally sure when it will happen. I only placed a bet of £1, the minimum you can do on a Pulse Bet, so the winnings aren’t massive. Even so, you can see that if a goal had gone in during the first three minutes of my allotted five minutes then I’d have won £1.80, with that amount moving up to £3.90 if it was scored in the following minute and a half. Should the goal have been netted during the final thirty seconds of my bet I’d have won £11, which is a very nice return indeed. In other words, whichever option you go for, you’ll be hoping that the goal comes within the last period of the time in order to win the largest possible amount of money. 10Bet refer to it as the Jackpot, summing up the fact that you’ll be getting a very nice return indeed on your investment. In terms of what you need to bear in mind about Pulse Betting, there are a few different conditions that 10Bet add to the offer. First and foremost, it’s not an option that is available on every single football match out there and it’s normally only something that you can do during the standard ninety minutes of a game. 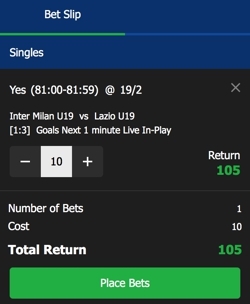 If you’re watching a knockout tournament game that might end up going to extra-time and penalties then you’ll find the Pulse Betting option disappears from the list of bets you can place. Interestingly, 10Bet are clear that Pulse Bets are only for the normal period of a football match. That means that if you place one during added time then it won’t be valid and will be made void. That doesn’t count for half-time, however, with Pulse Bets placed during the interval counting as starting from the forty-fifth minute of the match when the second-half gets underway. It’s also worth noting that only one goal will count towards the Pulse Bet that you’ve placed. In other words, if you think a bet will be scored between the seventy-fifth and eighty-fifth minute of a game and one goal is scored after seventy-seven minutes and then another one goes in in the eighty-fourth minute, only the first goal will count. Another key thing to remember here is that you don’t need to declare which team you think will score next. It’s not a bet on a specific team getting on the scoresheet, it’s just about there being a bet on the match in general. That might work in your favour if you place a Pulse Bet because a team gets a corner and you know that they’re great at corners, only for the other side to win the ball and counter-attack at speed. You’ll still win your money either way, with the chance of you getting the Jackpot amount increasing because the goal wasn’t scored when you were expecting it to be. Betting on football is tricky because you shouldn’t really place live bets on the club that you love, yet betting on a team that you don’t really care about or watch very often means that there’s a decent chance that your bet will be a loser. The reason you shouldn’t bet on your own team is that you’re too emotionally invested, meaning that you might not look at proceedings in the dispassionate way that you need to in order to turn a profit. Sometimes people are too optimistic about their side and are convinced that they’re going to score at any moment, other times they’re too pessimistic and believe they’ll either never score or will concede at a moment’s notice. Unfortunately, the problem with betting on a team that you don’t watch play with any degree of regularity means that you’re not going to be as sure about the way that they play and won’t necessarily be able to sense when the game is going to turn in their favour. Let’s say that you’re a massive fan of Stoke City or West Bromwich Albion and have seen them cause problems from set-pieces or corners throughout the season. You then watch Chelsea play and when they get a free-kick in a dangerous position decide to place a Pulse Bet on a Goal In The Next Minute. What you don’t realise is that Chelsea’s free-kick specialist is injured and their main striker hasn’t scored a header all season. As always, the top way of giving yourself the best possible chance of winning some money is to make sure you’ve done your research. Sites like transfermarkt.co.uk give you information on which clubs have a tendency to score during which time period. It’s not as detailed a breakdown as you might like, but a quick look will tell you that, for example, Chelsea scored eighty-five goals in the 2016-2017 Premier League season, with twenty of those goals coming in between the seventy-sixth and ninetieth minutes. That’s the kind of research that will help you decide which period of time to place a Pulse Bet on. One of the biggest reasons why it’s important to have knowledge of the teams that you’re betting on is that football often happens in waves. Yes, sometimes you can watch a game that is end-to-end and hugely open, but more often than not you’ll find that teams tend to enjoy periods when they’re on top in the game before it switches and the other one takes control. Being able to predict when one team is on top is key to making the most profit out of any Pulse Bets. You also need to be able to let it go if you place a bet but get it wrong. There’s no point throwing good money after bad, so don’t worry if you thought a goal was coming and it turns out you were wrong. That’s part of the trick of betting. This is the typical question that most sensible punters tend to ask themselves when thinking about any offer or future put forward by a bookmaker. Ultimately the truth of the matter is that bookmakers have one bottom line: their own profit. That’s why they’ll always give themselves a decent edge and will only keep features that are profitable for them. In the end, the house always wins. Yet still we place bets because we know that we’ll get a few winners from time to time and get ourselves some nice profit when we do. That’s why it’s tricky to talk about value with any degree of accuracy, because the bookmakers might always win in the long-term but in the short-term you’ve got every chance of giving them a run for their money, literally. A £10 bet on the standard market would have seen me receive £105 back, which is a decent enough amount of money. In the Pulse Betting market, meanwhile, I could have received anywhere from £66 if it was scored in the first thirty seconds, through to £220 if it was netted during the final ten seconds of the minute, via £95 if the goal happened in the middle of those two two slots. In other words, the risk of losing money on the bet was higher via Pulse Betting, but the chance of making much larger profit was also higher. Betting is always a case of risk versus reward, but with Pulse Betting that becomes even more prevalent. It’s really a question of how much you’re willing to take potentially lower odds in the hope of much higher odds coming your way if the timing of the goal works in your favour. £105 is the more solid return, but you could get more than double that if you placed a Pulse Bet and the goal came at the end of the minute. Is that worth the risk that you could end up with nearly £40 less? Everyone has their own answer to that question and the side of the argument you come down on will really depend on whether you’re risk averse or love a bit of a long-shot. If you’re the sort of person that always bets on the favourite during the Grand National then you’re unlikely to change your way of thinking here. If, on the other hand, you’re always tempted by the 50/1 rank outsider that you think looks like it’s in the mood for a big race then you’ll probably lean towards Pulse Betting over the more traditional alternative. The one thing I’ll say is that you’ll earn a profit anyway if your bet comes in and Pulse Betting as a generally thing is really very exciting.